Planning of resources and stock is part of day-to-day business for many companies. It is often organised by means of Excel lists and printouts of calendars – a consequence of which is a large number of different versions, numerous e-mails and, in the worst case scenario, a lot of wasted paper. The PARX planning tool enables you to complete your planning directly in Salesforce, share it with colleagues and work closely on it together, without losing a clear overview. Whether it's resources, stock, space or simply appointments – the planning tool can be adapted individually to your needs and customised precisely to suit your processes. 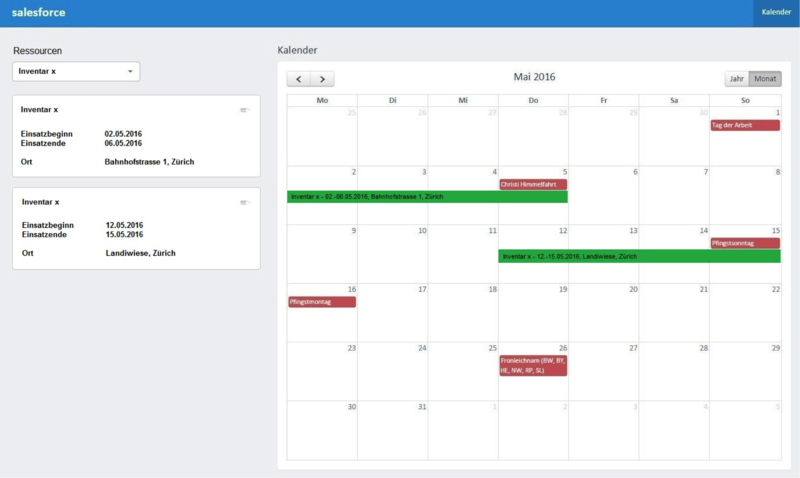 The planning tool is based on a calendar view. It can be used to schedule and move appointments, resources etc. using drag & drop. You always have an up-to-date overview of where stock is, how long it has been there and when it will become available again. At the same time, statuses can be assigned that prevent double booking – if a resource has already been scheduled for use at a specific time, it cannot be selected. The PARX planning tool is a product that must be adapted to your data model before it is used. But its display options and usability are then available to you very quickly and with relatively little effort. Fresenius University of Applied Sciences manages enquiries and applications through the Sales Cloud of Salesforce. From the first enquiry by a potential student to the signature on the study contract, all the processes can be mapped with Salesforce.